Yes, that's an iPhone. And yes, that's Android. iPhone users and Android users can stop fighting--because now your iPhone can run Android (as if Steve Jobs didn't already have enough on his plate with the iPhone prototype leak). Yeah, you heard me right. 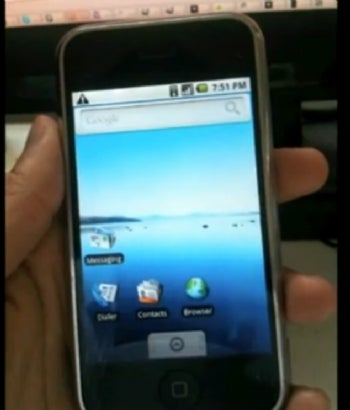 iPhone Dev-team member Planetbeing (the same guy who ported the Linux 2.6 kernel to the iPhone in 2008) uploaded a video to YouTube Wednesday evening that shows him successfully running Android on an iPhone 2G. Video after the jump. In fact, the phone doesn't just run Android--it also had dual-boot capabilities, by way of Linux 2.6 bootloader OpeniBoot, which is also a Planetbeing creation. Planetbeing's video shows him starting out in the regular iPhone OS and then booting to Android--albeit, a somewhat sluggish, not fully functional version of Android, but Android nonetheless. By the looks of it, Android on the iPhone plays music, browses the Web, and even makes phone calls with no problems. Planetbeing admits that Android on the iPhone is still in "Alpha," but notes that "pretty much everything works." There is a "button shortage" on the iPhone (since there's only one button), so Planetbeing has repurposed the volume buttons as the "call" and "home" buttons. While this isn't the best Android OS I've ever seen, it's certainly the first one I've ever seen on an iPhone! Planetbeing states on his blog that, while the hack only works on first-generation iPhones at the moment, it shouldn’t be too hard to port over to the iPhone 3G. He says that porting it to the iPhone 3GS will take a little more work, though. If you've got a first generation iPhone and you'd like to try it out for yourself, he's got the pre-built images and sources available for download on his blog.